- Longjing tea is produced in the West Lake area of Hangzhou, Zhejiang Province. It's named after a village and a well that are both called Longjing. 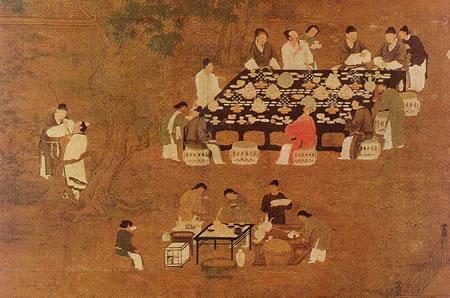 Since ancient times, scene of West Lake and Longjing tea have long been described in quotes of famous literati. Su Dongpo (1037 - 1101, once the governor of Hangzhou) said "Good tea is always like a pretty lady", a high praise of West Lake Longjing. It is green in color, fragrant and sweetish with beautiful shape, which are known as the "Four Splendors" of world famous Longjing. - Production places: Shifeng (Lion Peak), Longjing (Dragon Well), Meijiawu and Hupao, all in Hangzhou. Among these, Shifeng produces the best quality of tea. - Longjing tea can be harvested several times (Spring, Summer and Autumn) a year. But the tea picked in the very beginning of Spring is especially valuable. "Mingqian" Longjing is picked before "Tomb Sweeping Day" (called Qingming, one of the 24 solar terms of traditional Chinese calendar, usually during April 4-6), while "Yuqian" refers to green tea before "Grain Rain" (called Guyu, about two weeks after Qingming). "Mingqian" Longjing tea is of the top grade, followed by "Yuqian". The tea picked in other times is not so precious as the prior two. - Longjing has a soothing aroma and flavor. The taste is smooth, delicate and highly refreshing with a sweet floral aftertaste. As to what tea is, it is endowed with intrinsic spirit of South China and the delicate natural disposition of great land. It can dissipate the inner heat in the body and make people feel light and calm, yet this is not known to everybody. It is clear and charming.